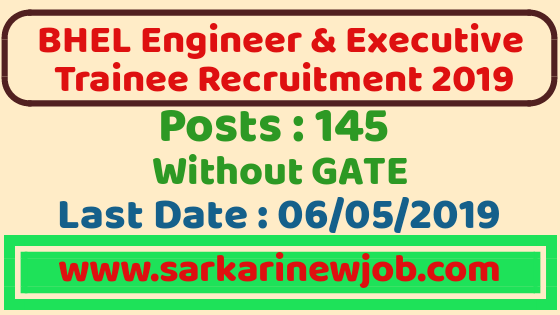 BHEL Engineer Trainee And Executive Trainee Recruitment 2019 | Without GATE | Freshers Eligible | 145 Posts | Last Date : 06/05/2019 - Sarkarinewjob.com A ultimate job portal to provide employment news. BHEL Engineer Trainee And Executive Trainee Recruitment 2019: Bharat Heavy Electricals Limited has published a recruitment notification for the post of Engineer Trainee And Executive Trainee. As per the Advertisement, there are a total of 145 vacancies for the post of Engineer Trainee And Executive Trainee. Candidates who are looking for government engineering jobs without GATE Examination can apply online for this post. Full-Time Bachelor’s Degree in Engineering /Technology or Five years integrated Master’s degree or Dual Degree programme in Engineering or Technology in the disciplines of Mechanical or Electrical or Civil or Chemical Engineering from a recognized Indian University/ Institute. Full time regular Bachelor’s degree from a recognized Indian University with atleast 60% marks in aggregate in all years With Two years full-time regular Post Graduate Degree/Diploma in Human Resource Management/ Personnel Management and Industrial Relations/ Social Work/ Business Administration with specialization in Personnel Management or Labour Welfare or HRM from a recognized Indian University/ Institute** with minimum 55% marks in aggregate of all years/semesters. Full time regular Bachelor’s degree from a recognized Indian University. 29 years for candidates having two years’ full time Post Graduate in Engineering or Business Administration/ Management. a) Candidates interested in joining BHEL as Engineer/Executive Trainee will have to appear for a Computer Based Examination. Based on the Examination Marks and requirement, candidates will be shortlisted for Interview in order of merit in the ratio of 1:7 to the number of vacancies in each discipline and Category. Physically Challenged candidates will be accorded upto 25% relaxation below the cut-off marks in their respective categories for being shortlisted for interview. b) For shortlisting as per 1:7 ratio, initially, all UR candidates of each discipline of Engineering/HR/Finance along with such reserved category (i.e. EWS, OBC, SC, ST) candidates of that discipline, who do not avail any relaxation, will be grouped together and then arranged in descending order of merit of their Examination marks (marks out of 100) and candidates shall be called for interview in the ratio of 1:7 in UR category. d) All the candidates obtaining same cut-off marks in respective groups shall also be called for interviews. e)The final merit list shall be prepared on the basis of 75% weightage to Examination Score & 25% weightage to Interview Stage.